It's a major heat wave in Boston- I think it was 80+ degrees this morning at 7am...! Despite the scorching temps, my office is an ICE BOX. The key is to wear something to balance the two "climates". PS: Going to see Eclipse in IMAX tonight- can't wait! Eclipse on imax!?! HOW COOL!!!! Love your necklace, great outfit! You look very comfy and stylish, very pulled together! I did a "what am I wearing" post too today! Ooh, I can't believe that blazer is from Old Navy - gorg! I love your dress-so cute! Have fun at Eclipse! What a cute outfit!! Have fun seeing Eclipse!! Love the new photo location for wiww.... who is your photographer? Look fab! Fabulous outfit! Eclipse in IMAX- you are so lucky!! I'd say it will be incredible!! Lookin' good! I have the same problem. If it is warm outside, it is freezing in the office and I have to use a foot heater. Cute outfit. It's awesome on the IMAX screen! enjoy. Cute blazer! Layering is essential for the two climates, as you say. :) It's the same in my office... and my co-workers like it ICY. You look great! I keep hearing how hot it us up there, but it sounds about normal for what we get this time of year in the South haha. Isn't that the worst? You walk from the 90 degree temperatures to the 60 degree office and you instantly need an outfit for a different season. 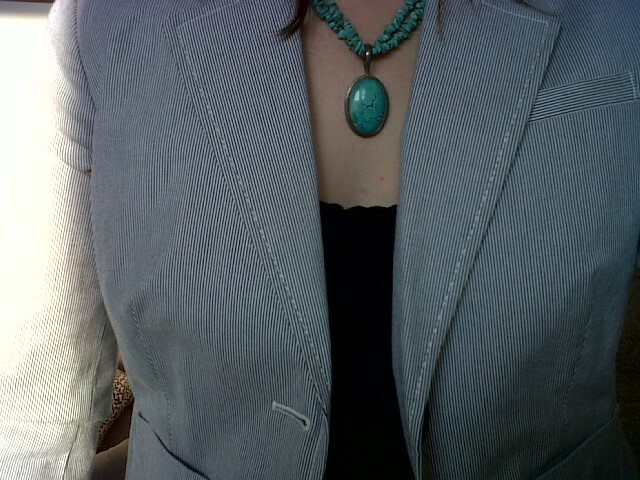 You layered perfectly and I love that blazer! Love that necklace, the fact that it was a Birthday gift from friends, makes me love it on you even more. Looking great! Very cute! 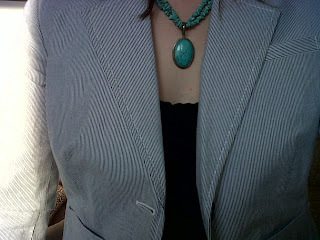 I am obsessed with turquoise - your necklace is beautiful! I worked in an ice box office for years. I remember leaving home in the morning in a sweater in the middle of summer and people looked at me like I was crazy. love the necklace..you are so cute. did you love eclipse or what???? Good for you with the gold sandals! 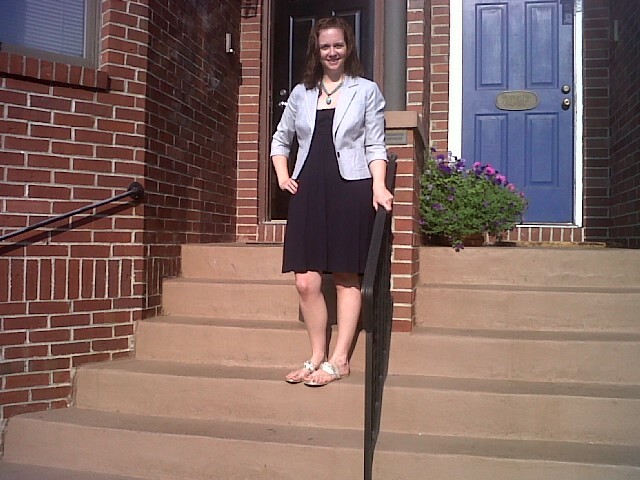 I just got a pair of gold flip flops and am loving them :) Your choice kept the outfit perfectly summer chic! Definitely! My office is so freezing. Really cute work balance, it's scorching here too and I love it. Is that your new brownstone? looks pretty!